UsenetServer was selected as the Best Usenet Service Provider by Usenet.com Review. Their retention, currently , is among the best and they aren't stopping there. In fact, they are one of the only Usenet service providers who are actively growing retention, and they continue to do so at no added cost to their customers. UsenetServer is a veteran Usenet provider and has been providing Usenet service for over 20 years. Over this time, UsenetServer has consistently provided the best retention rates, completion rates, download speeds, and overall quality of service. They also provide several premium service features that are included free with your account. Two of the most notable features are Global Search, which is a Usenet search interface that allows you to search for articles on Usenet and create your own NZBs, and a zero-log VPN (Windows, Mac, iOS, and Android clients included) that is very useful for securing all your online data and traffic (think websites visited, streams, downloads, banking, etc). These are just a few points that made UsenetServer stand out in our testing. For more details about UsenetServer and why we recommend them as our Best Usenet Service Provider, we've outlined them below for you to check out. All UsenetServer plans includes unlimited Usenet access with 256-bit SSL encryption. You can transfer unlimited amounts of data with top speeds from their US and EU servers (note: many Usenet providers just have US or EU servers, not both), maximized by the high number of concurrent connections included with all of their plans. You also get access to more than 100,000 text and binary newsgroups. This means you can check out different newsgroups on any pretty much any topic of interest and connect and share with literally millions of other Usenet users from every corner of the world. 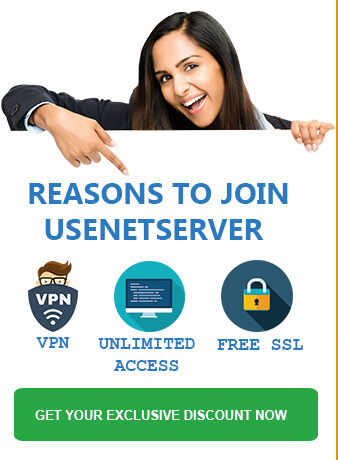 A major value-add is that UsenetServer gives you a zero-log VPN account for free with a yearly account. VPN access in general costs around $75-80 per year, and the free UsenetServer VPN account you get is as good as any of the paid VPN services. If you're unfamiliar with VPN, it stands for Virtual Private Network and is a protective encryption tunnel that secures all of your online data, browsing, streaming, and downloading. It can also switch your IP for an anonymous IP for any chosen location in the world (you can pick from many different country options right inside their VPN app) to give you an added layer on online anonymity. It sounds technical, but UsenetServer has made it very simple by creating easy-to-use iOS and Android apps in addition to Windows and Mac VPN software. It's free. Comparatively speaking, most VPN services charge you $75-100 per year for service. No bandwidth or usage limits. You can use it every day, all day, from any of your devices (iOS, Android, Windows, and Mac software included). They offer 3 VPN protocols — PPTP, L2TP and Openvpn. UsenetServer offers 2 special discounted packages for Usenet.com visitors. The packages are based on the duration of subscription, and you get more for less with the 12 month plan (60% off regular price) vs the 1 month plan (33% off regular price). 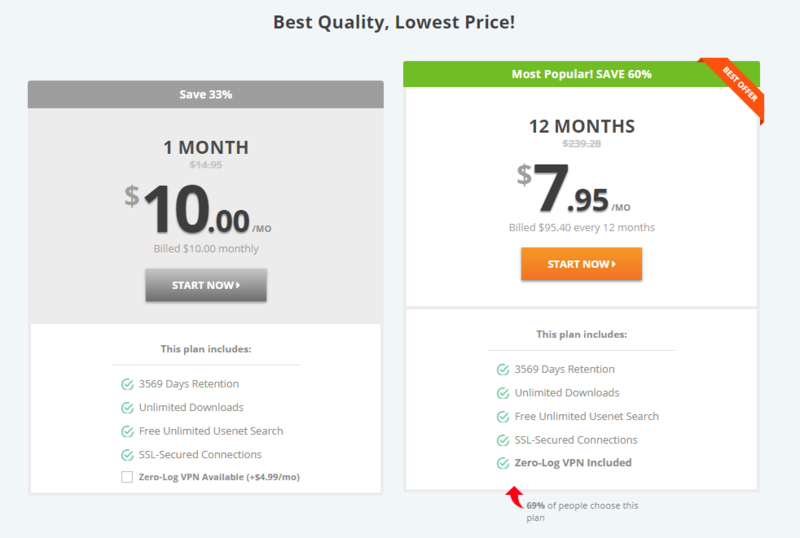 As far as value, the best deal is their 12 month option, which comes out to $7.95 per month ($95.40 total, normally $239.28) and includes unlimited downloads, max retention, access to Global Search, 256-bit SSL secured connections, and a free zero-log VPN account. Usenetserver offers a 14 day/10 GB free trial for all their plans. You can cancel at any time before 14 days or 10 gigs, which ever comes first. So go ahead try it for yourself you will not be charged. They make it very easy to get started. UsenetServer Global Search feature allows you to search for anything on Usenet by running a keyword search, then create and NZB to import into your newsreader for download. It also has some advanced features like filtering by group, poster, and post date. The Global Search engine can be accessed simply by logging into your UsenetServer account. UsenetServer operates a massive best-in-class network architecture for storage that, as of the time of this review, provides all users with access to articles posted to Usenet over 3,820 days ago. They are also one of the only Usenet providers that are actively growing their retention, and are not passing the cost of this network expansion to their customers. Peering relationships are also maintained by UsenetServer with all the major providers of Usenet to provide the best completion possible. This means that you can access nearly all articles posted to Usenet from anywhere in the world with near-perfect completion rates. UsenetServer offers 256-bit SSL connections to all subscribers on all plans. This ensures that you get secure and reliable connections to Usenet. UsenetServer also operates their own network, meaning you get direct access to a tier-1 Usenet backbone (vs getting access through a middleman reseller service). There are also more than 800 broadband access providers around the world that UsenetServer connects to, which means you don't just get outstanding speeds, but outstanding sustained speeds when accessing their servers. 24/7 customer support is offered to all account holders through live chat or email. They also have a comprehensive FAQ area, which includes a search bar, on their site that we find very helpful. UsenetServer offers the best service at the best price that we have seen on the Usenet market. Their Global Search feature and recent VPN addition makes them a top choice for any Usenet user.